If you’re looking for a home that’s as beautiful outside as it is in, then look no further than 3017 Smith Lane. This stunning estate is $1,699,000. It is located in Lynwood Downs, convenient to Cool Springs and I-65, and sits on five acres of land. The 1989 four-story home has four bedrooms and four-and-a-half baths. It is 5,108 square feet. There’s parking for three cars, but you’ll be able to host many, many more guests than just that. 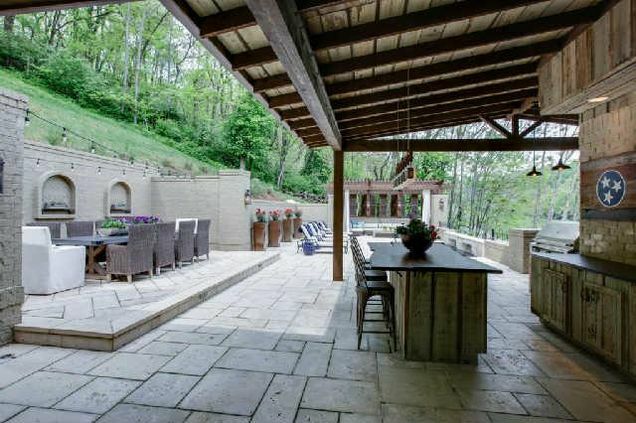 This home was made for outdoor entertaining. First are the porches that run the width of the house. As you walk out onto them, you gaze upon the beautiful, rolling hills of Tennessee. 3017 Smith Lane is truly an idyllic setting. The outdoor living area is magnificent. There is a bar and island, cabinets and a grill that’s built into the stone and brick architecture. Choose from covered or open-air seating for you and all of your guests. The bar is covered, but you can also fit a full-size dining table in one of the areas of the courtyard. The house is set up like a resort. You can relax in your lounge chair in front of the waterfall pool. Or, you can sit under the pergola on a sectional sofa. This home lets you enjoy all the beauty Williamson County has to offer in one breathtaking view, right from your backyard. There are several group seating and staging areas, as well as a built-in stone fire pit to the side of the home – breathe in the fresh air while enjoying this unbelievable property. Inside the house, you have an open layout. The living room and kitchen are connected and there are floor-to-ceiling windows lining a side of the room. It won’t be easy to forget you’re in such a gorgeous place. The elegant kitchen has white integrated cabinet-front appliances. The formal dining room has a chandelier and, once again, more natural light from all of the windows. 3017 Smith Lane is zoned for Walnut Grove Elementary, Grassland Middle School and Franklin High School. For more information call Judy and Richard Williams of Crye-Leike, Inc. at 615-373-2044.